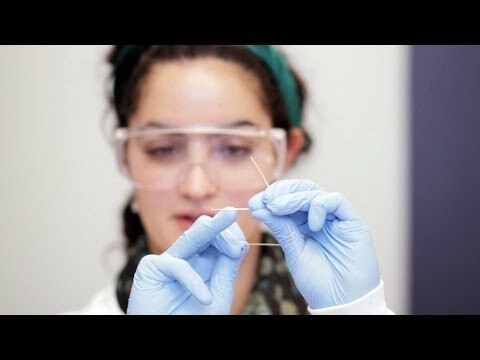 MIT senior, Christina Tringides, holds a sample of the multifunction fiber. MIT researchers reveal an interface that could make plugging our brain into a computer a reality. Their system uses new fibers less than a width of a hair that could deliver optical signals and drugs directly into the brain, along with electrical readouts to continuously monitor the effects of the various inputs. The new technology is described in a paper in the journal Nature Biotechnology. The result is the fabrication of polymer fibers ‘that are soft and flexible and look more like natural nerves,’ explains Anikeeva.